Welcome to ‘History’s Hidden Heroes’, a monthly feature in which I challenge my mental image of what a scientist looks like (American or European, and usually male) by learning something about scientists from elsewhere in the world or from other genders and ethnicities. Write in with your suggestions for what to call this feature. I’m not happy with “History’s Hidden Heroes” as a title because I bet that plenty of people know about these heroes – just not me! When I picture scientists in Africa, I picture white men digging for fossils and white women studying gorillas. But Africa has had plenty of its own scientists, including Professor Thomas Odhiambo, from Kenya. Odhiambo was an entomologist who was interested in biological ways to reduce agricultural pests. He wanted farmers, especially impoverished farmers, to have low-cost, environmentally sound, non-chemical means of reducing pests and maximizing yields. During his life, he published over 130 papers and six children’s books. 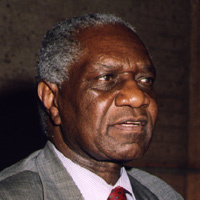 Professor Odhiambo lived from 1931 – 2003. He grew up in Mombassa and studied at Cambridge and in Uganda. One of his concerns was in not only educating Africans to be great scientists but in motivating them to stay in Africa once they were educated. Dr. Odhiambo founded three different schools of higher education in Kenya, including The International Centre of Insect Physiology and Ecology (Icipe). Odhiambo was particularly proud of the fact that most of Icipe’s PhD graduates are still working in Africa. My sources for this blog entry are African Success and The Guardian. I urge you to click on the links for more details about this amazing man. This entry was posted in History's Hidden Heroes and tagged Africa, Doctor of Philosophy, Education, Kenya, Odhiambo, Thomas R. Odhiambo, Uganda, United States.